When Bryon Martin's daughter, Zabelle, asked to have a Star Wars themed party for her 5th birthday, Martin stumbled into an unexpected art form: the light saber pool noodle. His wife Melissa Mazmanian found the idea on a Mommy blog and asked Martin, now a court-appointed attorney, to make light sabers out of pool noodles as party favors. "We overdo all of Zabelle's birthdays," Martin said. "And we were overdoing that one. Melissa found the idea [of light saber pool noodles] online and that became my committee. And being relatively underemployed, I threw myself bodily into my committee work." 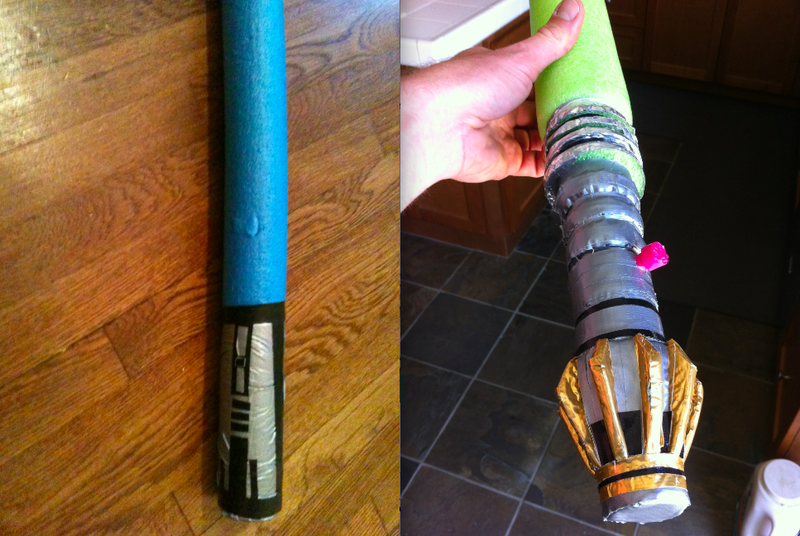 The image on the left is a typical pool noodle light saber, on the right is Bryon Martin's replica of Luminara Unduli's light saber (made of pool noodle and duct tape). Using only different colored duct tape, pool noodles and an exacto knife, Martin quickly went from merely taping up the "handles" to more elaborate taping, along with actually cutting the pool noodles to shape the handle. He also used the duct tape to "cinch" the foam pool noodle into desired shapes. "I wanted to differentiate them for the kids so they wouldn't all be the same." Soon Martin tried to create a replica of Obi-Wan's light saber. He was so pleased with the results that he replicated an Ahsoka Tano light saber for his daughter Zabelle to go with the costume she wore to her birthday party. "Really the whole hook for the whole thing is that it's like [rock] climbing in the sense that there's a flow-you kind of get into the moment of it. And it's also a craft." For Martin, the challenge of the art form came in using very limited materials to create complex light sabers. "It's fun to do the minimal. The limitations of the form are the attractive thing... You have to work around and within the form." But Martin decided to allow the use of one more material. "I brought in string because I did the Ahsoka [light saber], and I did the Anakin, and I did the Obi-Wan, and I decided I needed a bad guy saber. And I was feeling cocky... And I tried to do it with tape and that didn't quite work. And I thought, 'Well if I just had string that is still pretty pure, right?' [Duct] tape, pool noodle, a little bit of string." Finally, Martin began creating custom light sabers that weren't mere replicas, but were originals he designed himself. "By that point, weeks into it, the birthday party is a faint memory, all the cake is gone, you know? And I'm still staying up until 2:30 a.m."
Martin now thinks of each of these stages of light saber pool noodle development as different "generations." The light sabers evolved from simple "first generation" models to much more complex "fourth and fifth generation" light sabers. Making pool noodle light sabers brought Martin deeper into the Star Wars universe than he'd ever been before. "Once I did all these technically demanding ones [pool noodle light sabers]... I got a sense of what the components are. I learned schematics of the assembly of a light saber." Martin's elevation of the pool noodle light saber from Mommy blog craft to fan fiction art form illustrates the fact that passionate -- sometimes absurdist -- dedication to an unlikely task can result in unexpected ingenuity, artistry, and craftsmanship. Click through the gallery below to see Martin's pool noodle light sabers transform over the "generations," and tell us what you think of this unexpected art form in the comments.